From December 1-12, world leaders are meeting in Lima, Peru to lay the groundwork for a global agreement on climate change. But aside from being a setting for this round of international climate talks, the Latin American region is facing significant security and development threats from climate change that are not often reported. Climate change is a stressor that will compound, and already is compounding, vexing preexisting developmental challenges across the regions’ states – testing governments to the limits of their capacities and affecting populations in diverse ways. While this “stressor” is becoming better appreciated by development stakeholders, a dimension that is not as well-appreciated is the impact climatic and environmental shifts will have on states’ security in general, and on the operations of regional militaries more specifically. Below is a sub-regional breakdown – a sort of “get to the point” compilation – of the implications of climate change on this growing, dynamic and increasingly relevant region of the globe. The compilation draws from and builds on a joint military assessment I contributed to as a consultant for U.S. Southern Command (SOUTHCOM). The geographic categories below reflect a structure commonly used in the U.S defense sector. The 2014 Intergovernmental Panel on Climate Change (IPCC) reported with “high confidence” that “significant trends in precipitation and temperature have been observed in Central America.” The U.S. military earlier this year completed a joint assessment with its counterparts in Chile, Colombia, El Salvador, and Trinidad and Tobago on the defense implications of climate change. In the report, El Salvador reported “that due to its location between two oceans it is extremely vulnerable to hydrological systems that include torrential rains, flooding and mudslides.” The interplay between more frequent devastating rains, extreme violence, and weak institutions (especially, the ones responsible for providing social safety nets) can severely affect livelihoods in Central America and may lead to episodic distress migration. Larger and seemingly more resilient states are also vulnerable. In September, 2014, Hurricane Odile was just one in a string of high intensity storms in recent years that has compelled the Mexican military to remain in near-persistent disaster response mode. According to reports, the powerful Category 3 hurricane left 239,000 people in the state of Baja California Sur without electricity and about 30,000 tourists in temporary shelters. Security implications: Central American militaries (especially Honduras, El Salvador and Guatemala) can expect increasing crisis response operations. Further, the U.S. military, working in conjunction with other federal entities such as the U.S. Office of Foreign Disaster Assistance (OFDA), can reasonably expect to continue (and even expand) its long tradition of assisting Central American nations with: 1) strengthening their capacities to respond to natural disasters (i.e. capacity building) and 2) the provision of direct military support in emergencies (i.e. supplies, and airlift). Regional militaries might also be compelled to expand and intensify contingency planning and exercises to better prepare to save and assist distressed population. Like their Central American counterparts, Caribbean states that the U.N. categorizes as Small Island Developing States (SIDS) are also very vulnerable to extreme weather events, due principally to the sizeable populations living along coastlines and the nations’ relatively weak response mechanisms. The IPCC’s Fifth Assessment Report verified observations in the Caribbean that temperatures and sea levels are rising, and extreme weather events are occurring more frequently. Consider that damaged critical infrastructures (e.g. ports and roadways), which many Caribbean nations depend on to facilitate key industry activities (e.g. agriculture and tourism), can disrupt the economic process for many years. In extremely fragile countries like Haiti, the possibility of increased migration into neighboring states (e.g. Dominican Republic) is not far-fetched, even if only the best case climate change scenarios become reality. 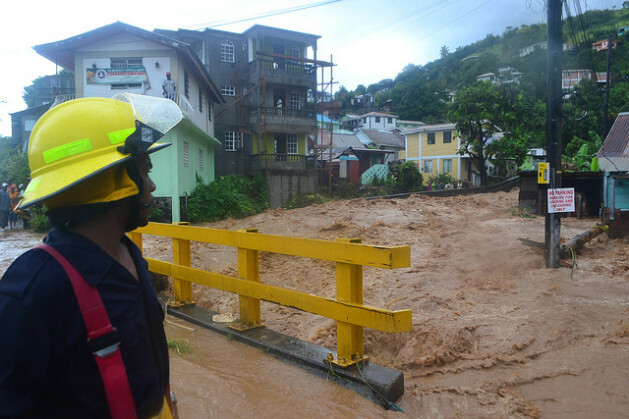 Security implications: Caribbean military forces – working in support of national civil authorities and organizations like the Caribbean Disaster Emergency Management Agency (CDEMA) – can expect increasing requirements for search & rescues (SAR) and recovery operations in the wake of intense storms. Militaries will not only have to build their respective capacities (e.g. equipment procurement and training) to assist distressed communities, but will also be compelled to work with and through regional defense organizations like the Inter American Defense Board to pool resources, share best practices and hone specialties. Changes in weather and climatic patterns are negatively affecting human health in South America, through the emergence of diseases in previously non-endemic areas (IPCC). The previously cited SOUTHCOM report notes that Chile may be faced with “scarcity of water, sanitation issues in coastal cities, and contamination of underground aquifers due to saline intrusion.” In Brazil, an epic water crisis continues unabated in São Paulo and other cities. The 2011 Urban Water Supply Atlas estimated that “the regions that supply 73% of the country’s water needs could face shortages over the next decade.” By June, 2014, over 140 Brazilian cities had implemented water rationing during the worst drought in over twenty years, with some neighborhoods only receiving water once every three days. The affected cities represent approximately six million people, the majority of whom are employed in the agriculture industry. Security implications: Chile continues to be a regional standout, renowned for its steady economic growth and relative stability in a neighborhood known for the opposite. However, a convergence of climate induced impacts which include variations in sea levels, rapid glacier melt, forest fires, and infectious diseases might test its hard-earned domestic tranquility in coming years. Water stress in the region can have ripple effects across the globe – in particular across food markets (i.e. Brazil is the world’s leading exporter of soybeans, coffee, orange juice, sugar and beef). Brazil – the world’s sixth largest economy – continues to experience steady population growth and its government continues to struggle to deliver the public goods citizens were promised. Spasms of social unrest akin to the episodes witnessed prior to this year’s World Cup are possible, especially if drought continues to plague the most populous country in the region. The recent kidnapping (and subsequent release) of a high-ranking Colombian General a few weeks ago is an indicator that the conclusion of the world’s longest running civil war is not a done deal, despite ongoing peace negotiations. Security challenges abound in Colombia due to a crippled but still very active insurgency, illicit organizations and the onset of very consequential climate change effects. Floods, droughts, forest fires and tropical storms are a few of the impacts reported in the previously-cited military joint assessment. A convergence of these impacts can become a toxic mix creating instability in rural communities, and forming a more permissive environment for crime and violence across the sub-region (especially Colombia, and Venezuela). Plunging Venezuelan oil prices (from $99 to $69 a barrel since June) and intensifying social unrest are man-made trends that the Venezuelan government must find deeply troubling. In addition to these trends, Venezuela will be compelled to contend with very damaging episodic natural occurrences like torrential rains, which have devastated rural communities in recent years. Security implication: Many Colombian military installations are interdiction launch pads, and are therefore located along the river banks and coastal areas. Sea level rise will disproportionately affect these units critical to counter-insurgency and counter-drug operations. There will also be increased pressure on military resources as forces in the region are compelled to adapt units, installations and operations for environmental shifts. In Venezuela, the government’s ability to keep its Revolución Bolivariana promises will be tested to the breaking point if already dire economic and security conditions become exacerbated by any of the aforementioned natural impacts. The World Bank reports that “in 2011, for the first time in recorded history, the region [Latin America and the Caribbean] had a larger number of people in the middle class than in poverty” but that after a decade of “sound economic management with solid social progress” slower growth might be a harbinger of a roll back in hard-earned gains. Weak institutions laboring to meet expectations of burgeoning young populations will have to adapt their developmental calculus to factor in climate change or face persistent varied expressions of social stress and upheaval. Governments should also keep in mind that even if only the tamest of climate change scenarios play out, their defense-related organizations can expect to play an increasingly robust role as both first responder and peacekeeper. By Caitlin Werrell and Francesco Femia in climate and security, national security on December 8, 2014 .